Another week of mayhem and progress – of sorts. Having made my proof-readers’ lives hell by pressing them to complete as much as possible against the clock (with the rather minimal bribe of runner beans) I entered all their brilliant catches into my final file in InDesign and… pressed the button to send the text to the printer. I then got my head round the file requirements of the cover picture, recreated the file with the correct dimensions (then correcting that when I found I had misunderstood) and sent it for checking to a great designer (whose time I can only afford by the minute). Umm… although I have reservations about my cover (because it has no figure in it), I have grown fond of the beautiful image my daughter put together and I want it to go to the printers as soon as possible. (NB you are never sufficiently ahead of the game in publishing), so I felt I had to turn down this opportunity – something I would have lain in the mud for a few weeks ago. However, we have a compromise. 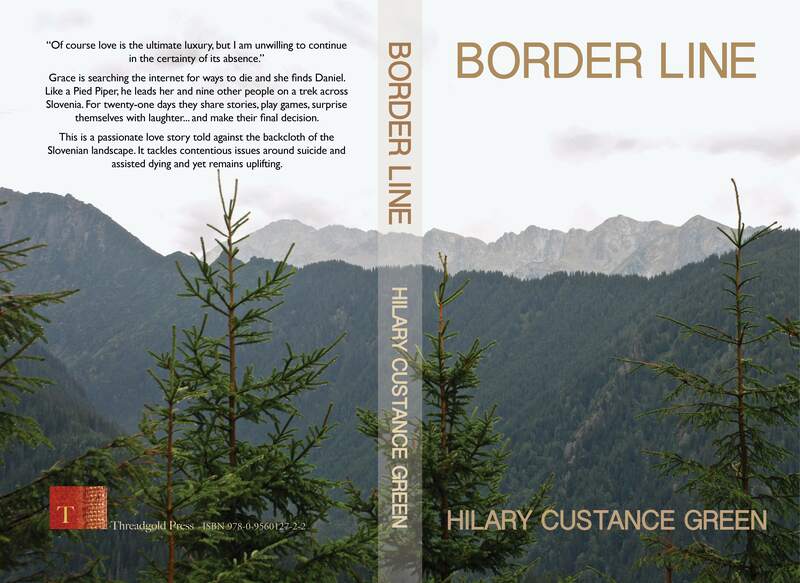 I will now have a design by Bronze Design for my eBook version of Border Line. CORRECTION: I now have bronze level design by 99Designs for my eBook version of Border Line. I have also been in touch with the travel company, Just Slovenia, who, way back in 2009, helped me set up an itinerary to research many of the places that feature in Border Line. They responded and I have now sent them a PDF of the novel. I’m not accustomed to so much progress up the ladder, I’d better get ready for another snake. This entry was posted in Reading, Uncategorized, Writing notes and tagged Book cover design, book covers, border line, Bronze Design, graphic design, Hilary Custance Green, Just Slovenia, self-publishing, Slovenia, Writer's Workshop by hilarycustancegreen. Bookmark the permalink. No. Definitely ladders all the way from now on. Lovely cover image. I don’t think it needs a figure. Thanks, that’s encouraging. I notice that artists like it the way it is, but people in the book trade say, with unnerving certainty, that for this genre (light literary?) the typography is not quite right and there should be a figure. You’re so kind. I hope the contents live up to it. It looks great Hilary! Congrats! Thanks, it seems amazing how much emotional investment a cover takes. HILARY !!! – this cover is GORGEOUS !!! (What on earth is he talking about when he makes ref. to computers ???) I am simply bowled over by it: it’s beautiful; it’s enticing; and it does exactly what a cover should do. You ARE clever !!! So glad you liked it. The computers refers to my brief for the competition (back view of girl at computer, Slovenian landscape in the background). I LOVE your cover Hilary 🙂 It screams Slovenia :). Good luck with your book! Well it gets my vote too and I’m looking forward to the final version – when is D Day? Snakes are for wimps. Ignore them. Onward and upwards.